This is the type of friend who has seen you at your best and loved you at your worst. The type of friend who knows your backstory and understands the crazy parts. The type of friend you text after a two-hour conversation because you remembered one more thing you wanted to share. The type of friend with whom you can pick right back up, without a hitch, after times of silence. It's the type of friend who makes you laugh, embarrassingly so. The friend who understand your quirks -- those OCD tendencies, that inability to make a quick decision, that unspoken request that you don't want to be the one who orders the pizza over the phone, or that affinity for 80's music or sweet pickles or telling stories about your cats. This is the friend who has seen you through bad hair styles and bad life choices. The friend who feels pain when you're hurting and comes alongside of you, encouraging and praying and supporting, until you can move forward again. Even if they have to listen to you tell the same story more times than necessary because it helps you to process things aloud. And you love them in the same way, no questions asked. Thank God for these friends! 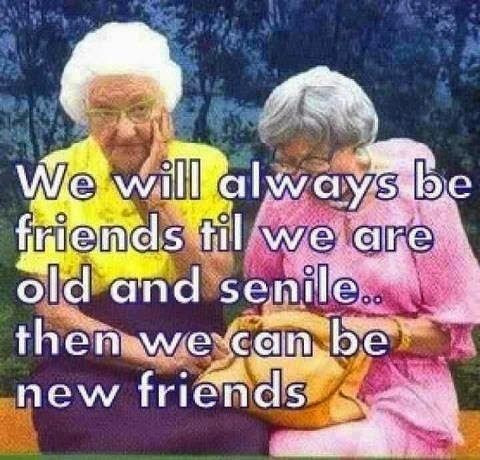 May we have them until we're old and senile, indeed. Thank you! I immediately posted this on the wall of a private FB group for a group of 8 college friends. The response was a series of enthusiastic likes/comments from the girls. :-) We've been friends for 11 years (some of us much longer – going back to elementary years) and still do our best to stay updated and in touch. Praise God for friendships like these!